Yesterday was the day for countries; today was the day for mountain passes. We left Flims after breakfast - stuffy English people. Headed southwest to Desentis and changed money. We thought we were headed towards Andermatt, but found ourselves on the top of desolate and spectacularly scenic mountains. We had the feeling, though, that we were on the wrong road. Sure enough, right after we crossed the top of a pass, we saw signs that read "Olivone" written (or etched) in stone by the side of the road. 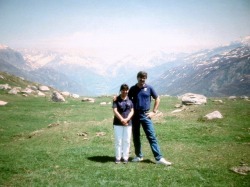 t turned out that we had just crossed the Lukmanier Pass and were headed towards Italy. Turn around? Nah! We took the twisting, turning 1 and 1/2 lane roads south towards Biascia. On the way we stopped at a small town to confirm our hotel for tonight. The phone was outside the Post Office and I went inside to buy stamps. The Post Office (Bank) was a one-window affair. After the postmaster dispensed large amounts of cash to 2 locals in front of me, I stepped up to but 12 postcard stamps. Easier said than done! He spoke no English or German - only Italian. I tried to ask for what I wanted but was dumbfounded. Finally after some "Pictionary" and assistance from 2 other locals, I emerged victorious with the stamps. Unfortunately I left our indispensable "22 Days in Germany, Austria and Switzerland" by Rick Steves in the phone booth. Oh well, we were going to wing it for the last week anyway! So we headed back north to the St. Gotthard Pass, and went through another amazingly long (15 km) tunnel. We has planned to go via the Sustenpass to Interlaken, but after we emerged from the tunnel the signs said that it was closed. So back south to Andermatt to head over the Furkapass. It was the best detour of my life! The scenery was absolutely spectacular. The roads were quite hairy - 1 1/2 lanes, no guardrail, 2000 foot plunges off the side. But the scenery - amazing! Rocky snow-covered crags, glaciers, twisting, turning roads -- you'll have to see the pictures! Jill's door handle is still intact though. Had lunch of ham and cheese by a rushing river in a valley. We then headed up the Grimselpass which was not as spectacular after the last 2 1/2 hours, but would still put Yosemite to shame. From there it was "all downhill" to Brienz, a quaint village. But by that time it was 3 p.m. and we were tired of driving. So we headed directly to Gimmelwald. Gimmelwald is located above a valley south of Interlaken. We drove down the valley, stopping for tomorrow's lunch in Lauterbrunnen. Also had an ice. Then it was time to board the cable car / tram for the ride up to Gimmelwald! The car was huge, and fast. We rode the 1000 - 2000 feet up to Gimmelwald in about 5 minutes. The view was spectacular (again) passing waterfalls in full view of the Jungfrau and Eiger peaks. Truly an "uplifting" experience. Got off the lift and took the long way around town (about 35 houses) before finding the Hotel Mittaghorn. Had to wait about 10 minutes while our landlord, Walter Mittler, cooked the dinner preparations. Then we were shown our dingy little room which got Jill quite depressed. But the trick here is to enjoy the incredible view, incomparable to anything in the U.S. So we went out front, had a beer, and wrote some postcards. Jill felt much better. Then a walk before dinner of potato-leek soup, and pork stew over spaghetti. Very good and it hit the spot (youth hostel style). 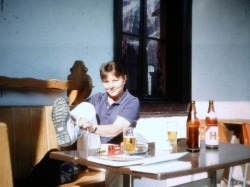 Then another beer while we watched the sun set on the Jungfrau, though it set on this side of the valley 1 1/2 hours ago.